Yesterday, at this writer's retreat, we drew. It was the end point of a series of exercises, a shift in media, another way to stimulate the flow of creativity in the room. The materials were simple ... sketching paper, crayons, pastels. The instructions clear: create an image of what caught our attention in the previous exercise. We could replicate it (or at least try), create a resemblance of it, capture the feeling of it or our relationship to it, focus on one quality of it or try find an image of the impression it left. Thirty-eight adults sat drawing on the floor like children, absorbed, giggling, trading crayons. Then, unlike children. embarrassed about our less-than-perfect results, we shared with one other person our image. My "sharee" told me what she saw in mine and I told her what was intended. Then we switched. Her view gave me a whole new insight which deepened my experience. Then we had an "art walk" .... put our images in a circle and walked around them reveling in the vibrant diversity, excited by the swirl of creative flow that filled the room. It didn't matter that the level of art accomplishment was spotty at best. It didn't matter that none of these images would wind up in a gallery. It didn't matter that most would be discarded before the end of the retreat. What mattered was that we were, in that moment, joined together in the magical process of creation, that we had opened our selves for just an instant to the gaze of 38 strangers, that we were connected and intertwined in the presence of creation. We are creators, a species born with an impulse, a need, to create. I am grateful for this need and for this opportunity to be in community with others who have recognized the need and are following their natures with such joy and abandon. 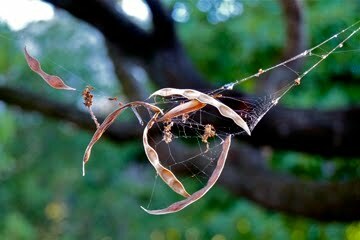 About the Image: Yesterday several of us walked up to the Vedanta Temple where I found this magical image ... a spider's art. This image is magical Joyceann, as is your writing and your being. Thank you for sharing your magic! I'm so glad you decided to go to the workshop. It's inspirational to read about it, to learn of the joy it's bringing you. It's wonderful how art transcends to create community!